TL;DR: I love pixels and their 3D brothers, the voxels. MagicaVoxel is great to make 3D. Use the hintbox. Using a 2D pixel sprite to make a 3D model is easy and how I took advantage of this. It’s easy to share your work in Sketchfab. I have recently joined the team of Sketchfab. As part of the job I get to look at great models everyday from some of the best 3D artists out there. Being passionate for 3D and looking at great artworks like Van Gogh’s room, made me want to give 3D modelling a try. Since I grew up in the 8-bit era of gaming consoles pixelart always seduced me with its charm. Recently we have seen a rise in this art style due to nostalgia (and the fact that it is awesome). This renaissance of the pixels has pushed the art to new possibilities that were not available back when I was a kid. One of such revolutions is the 3D pixel, also known as voxel. Doing voxel art appeals to me not only due to its beauty, but also due to its simplicity. The entry barrier is so low, that even I, using a not so great linux laptop (which makes things harder), got around to making my first model in a few hours. If you want to get started, download MagicaVoxel. If you are new to Linux, (like me) you can install PlayOnLinux and follow this installation tutorial. Once you are up and running, don’t be afraid of MagicaVoxel’s interface. There is a lot going on for a first timer, but there is one trick to understand it very quickly. In MagicaVoxel the first thing you need to look at is the Hintbox at the bottom. In MagicaVoxel the first thing you need to look at is the Hintbox at the bottom. In fact, if you look at the hintbox in that gif, you will understand that I picked the Voxel brush, with the task erase. I used it to erase a few voxels, and then changed to attach to add some voxels. With those 2 things you can almost start making models. For my first model I stuck to the basics. I used only the voxel brush, and a few of its utilities; I prepared the scene and I made my color palette. I will show you all of this, but first let’s pick a 2D sprite. This is a resized and rearranged version of a sprite. In that website I picked up a sprite and loaded it in a paint like program (on Linux I use Pinta). I zoomed to the pixel level and rearranged the image to have each pose side by side. This way it is was easier to get right the proportions of each part of the model. This sprite is just a reference. As you can see, not all poses have the same size, and the character is not looking at the camera, nor completely sideways. This means that the sprite does not map pixels to voxels directly, so you will have to make some decisions about the real size of the model. Now that we have the sprite ready, let’s dig into it. The face forward pose has around 12 x 30 pixels and the side pose has 10 x 30. This means our model has about 12 x 10 x 30 pixels total, so we can make a new file in MagicaVoxel with those dimensions. We are almost ready to start making the model, but first let us prepare the color pallete we’ll use. 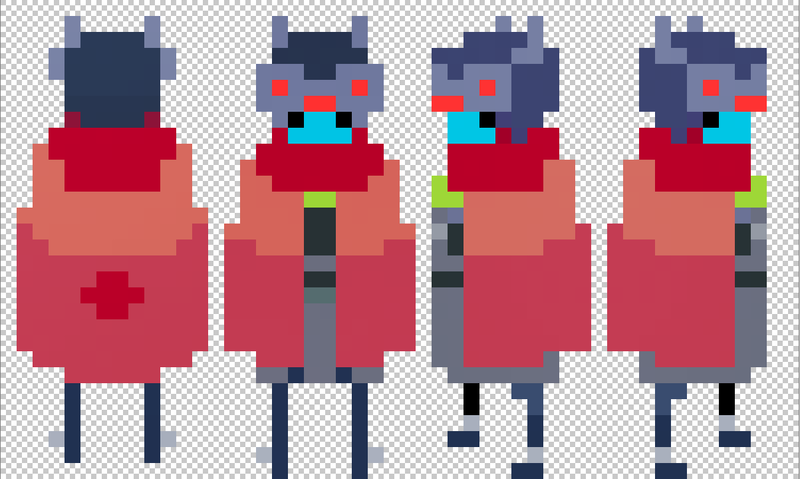 Once again, we go back to our sprite to get the color references. And we add these values to a new palette. You can do this for all the colors in your model. TIP: When adding the colors from the sprite, remember that you don’t need the darker tones used to make the shadows. TIP 2: You can organize your colors by where you use them. See the image below for an example. First line is the body. Second line is the cloak. Third line is the head. Now that everything is ready, we can start making the model. To do so, we will need to move the camera, attach and erase voxels, and move parts of the model. Camera — We can move the camera around by using the left mouse click while moving the mouse. We can pan the view by pressing the SPACE bar and moving the camera. Similarly, you can use the QWEASD keys and QWEASD plus holding the SPACE bar to move the camera. Attaching and erasing voxels — In the first gif I showed you how to attach and erase voxels, but if you paid attention to the hintbox, you know you can use T and R as keyboard shortcuts. This will save you a lot of time. You might also want to enable mirror options. I personally use mirror X a lot. In this gif I just zoomed in, I choose the attach voxel with mirror X and started drawing. Since I was not in the right distance, I used the shortcut R to change to erase and erased the wrong voxel. I then changed back to attach (T) and drew the legs. Small mistake, R and T and we’re back to business. Moving parts — With what I just showed you, you can make the whole model, but here is another trick that can be helpful. You can change the size of the scene to move part of your model while you work on the rest. For example, if you look for other images online, you can see HLD has gray gauntlets. To add that detail I had to move the cloak away. I used the box select(N) and move to do so, and painted (G) the voxels under it. Once you’re done with your model, you can export it as an obj file, zip it, and share it on Sketchfab. The basic idea is you create an account, you click on upload, and you chose your file. For a more in depth guide, check out Bart’s guide. I hope this helped you out, and I love feedback, so feel free to leave a comment either here or on the model.